Coventry City are in the play-offs. All those years of longing, that desperate hunt for that mythical spot in a four-way end-of-season tussle for promotion are over. All that time wondering just what it would feel like when Coventry City made the play-offs, well, this is what it feels like – and it’s somewhat anticlimactic. Perhaps it was the manner of getting there, via a 0-0 final day draw with Morecambe that became a meaningless game due to the results elsewhere, but it doesn’t feel the achievement that I thought would be. Maybe it’s simply because we have yet to achieve promotion. There was an expectation that getting to the play-offs would be a prize unto itself, yet this season would feel like a disappointment if we were to fail to convert our first top six finish since 1970 into promotion. That excitement may well rise come the time I take my seat at the Ricoh to witness the first ever Coventry City in the play-offs, but the past 46 games have been about getting to this point and the next two – then hopefully the one after that – are the ones that count. This game is going to bring a unique pressure that this team will have to manage, especially because the first leg is taking place in front of what looks to be a big crowd at the Ricoh Arena. Previously, the feeling about this team was that we could play up in these kind of big games, but those recent defeats to Lincoln and Notts County, along with the 6-2 to Yeovil, must surely have dented the belief that this side has in turning it on for the big occasion. It’s crucial that Mark Robins remembers that this is a two-legged tie, while it would be great to have a big win in front of our own fans, the team needs to exhibit an element control over their emotions should there be goals at either end. Winning this game doesn’t guarantee a place at Wembley, losing this doesn’t mean that the tie is over. As for the team selection, it’s hard to see Robins deviating too heavily from the side that started against Morecambe – although our manager has been rather erratic with his team selections in recent weeks. With Tom Davies and Chris Stokes having calmed down the defence over the past two games – and probably being better suited to Notts County’s threats than Rod McDonald and Ryan Haynes – the biggest selection decision looks to be whether to start Jonson Clarke-Harris or Maxime Biamou alongside Marc McNulty. Clarke-Harris offers that extra level of mobility required to set a positive tone for the game in pressing our opponents high up the pitch, Biamou offers more of an out-ball for our defence and is possibly generally more of a calming influence up front in a game where cool heads may well be the order of the day. As mentioned earlier, our recent meeting with Notts County is likely to be still fresh in the memory for this team. In what was a dreary contest between two sides relatively low on confidence at the time, Notts County looked to have taken a decisive lead in the 60th minute via Jonathan Forte from a corner routine. If any side looked like scoring the next goal, it was probably Notts County, however, Jordan Ponticelli backheeled an effort during a goal-mouth scramble to make it 1-1 with five minutes remaining and sending the away end into pandemonium. With almost our entire XI caught up in the celebrations – seemingly injuring Jonson Clarke-Harris at one point – this looked to be one of the moments of the season. When Notts County booted the ball out from the subsequent kick-off, that should have been the cue for us to slow things down in order to take a valuable point. Instead, Jack Grimmer rushed the throw-in, handing possession back to Notts County. Liam Kelly then miscued an opportunity to clear the ball, allowing Shola Ameobi to square the ball to Jonathan Forte to hand Notts County back the lead. A point gained and surrendered in barely a minute, with the team failing to control their emotions in a big match. Please don’t be an omen. That win was an important one for Notts County, with their season threatening at that point to spiral out of control. Kevin Nolan’s side went on a run from that point that almost saw them challenge Wycombe for the third automatic promotion place, before a surprise defeat to Grimsby in the penultimate game of the season ended that prospect. While Notts County aren’t the same side at this moment in time as the one that blitzed the division for the first half of the campaign, they have shown a mental strength to recover from a poor run of form and claim a play-off place when quite a few other sides may well have crumbled in a similar situation. 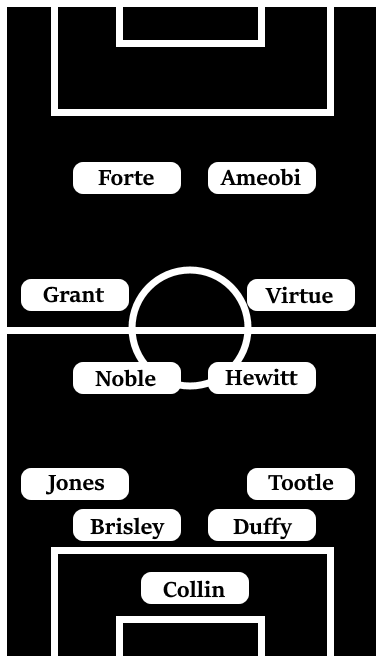 Kevin Nolan has Notts County set up in fairly rigid 4-4-2 system, where the defence looks to do the basics well, the front two tend to be big physical presences and the midfield are there as willing runners to support the attack and to provide shape in front of the defence. The mid-season loss of key holding midfielder Ryan Yates has been a blow to Notts County, and it’s probably in that area of the pitch that we should be looking to exploit. The preferred pairing at the moment is Elliott Hewitt and Liam Noble, while Hewitt is a similar kind of player to Yates, Noble is a far more erratic – at times, very good – and is possibly someone who could blow a gasket in a big game if we can niggle and wind-up him up in the right manner. Out wide, Jorge Grant remains a key player despite a loss of form over the final months of the season. In attack, Jonathan Forte has stepped up to provide something different – in his case, pace – to Notts County’s system, alongside Shola Ameobi, who’ll we need to make sure has a quiet game. Finally, at the back, Notts County’s four-time Coventry City loanee Richard Duffy is a key organising figure for the side. One thing to watch out for with Duffy is his preference to try and win soft free-kicks when forwards close him down in order to ease the pressure on the defence. Should Jonson Clarke-Harris start, it will be interesting to see who comes off best in the battle to win the cheapest free-kicks. We’re facing two opponents here in this game, the first one is Notts County and the second one is ourselves. Recent defeats in big games will have dented that belief we’ve had this season that we’re capable of playing up when the big games come, there is going to be nervousness in the side to avoid another Lincoln – or worst case scenario, Yeovil – kind of result. With Notts County probably happy to take even a narrow defeat into the second leg at their place, it’s going to be a tight game if the manager’s get their way and neither team makes the kind of big mistakes that nerves can cause in these kind of games. The positive for us is that a big crowd could spur us on to a big performance, the downside is that it can either lead to errors or an unnecessarily gung-ho approach to try and please the home fans. I’m not confident that this team is currently capable of managing the kind of atmosphere that will be around this game, I’m predicting a 2-0 defeat which could be very difficult for us to turn around at Meadow Lane.